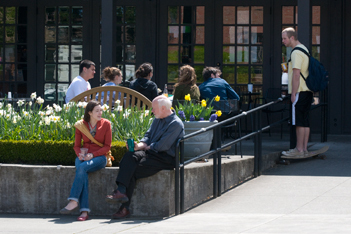 Each year 75 undergraduate students choose to transfer to University of Puget Sound. In reviewing transfer applications, the office of admission looks for academic excellence and for interesting people who can contribute to the life of the university. We review applicants' entire college program, including the rigor of their courses, their grades, writing ability, and extracurricular and community activities. In order to simplify the application process for our prospective students and uphold our commitment to environmental responsibility, Puget Sound uses the Common Application. Transfer students may begin their academic work at the beginning of any semester. Applications received after the preferred deadlines will be accepted on a space-available basis. We will mail our admission decision as soon as possible after all necessary documents have been received. If you have any questions or concerns regarding transferring to Puget Sound, please email or call the Office of Admission at 253.879.3211. We continue to accept transfer applications for fall 2019 on a space available basis. Complete the Common Application, including the essay and $60 application fee, and submit your application online by the priority deadline. The application fee is not required if you have previously applied to Puget Sound. The College Report signifies eligibility to continue and/or honorable dismissal from your current institution, or the one you attended most recently. Complete your portion of this form and give to your college advisor, registrar, or other administrator. The Academic Evaluation should be completed and sent to Puget Sound by an instructor at your current institution, or the one you attended most recently. Complete your portion of this form and give to your instructor. Official College Transcripts from each college or university you have previously attended should be sent to the Common Application Processing Center. Puget Sound requires a minimum cumulative grade point average of 2.0. (The average grade point for entering transfers is 3.35). If you are currently in your first term of college coursework, you should submit your official transcript as soon as the term is completed. However, it will not be required for admission review. Submit your Final High School Transcript: Required for transfer applicants who took college courses prior to high school graduation, or who have completed less than a year of college coursework. Submit your official SAT/ACT Scores or Test-Optional Questions: Required for transfer applicants who have completed less than a year of college coursework. Upon receiving your application, we’ll contact you about submitting test scores or test-optional questions. Submit your official TOEFL or IELTS results: Required for some international students. Learn more about the TOEFL and IELTS exams. Complete the audition application if you are interested in major, minor, or scholarship consideration for the School of Music. To audition, complete the audition application by Nov. 1 for spring admission and Dec. 10 for fall admission. Note: The Arts Supplement to the Common Application is not accepted.